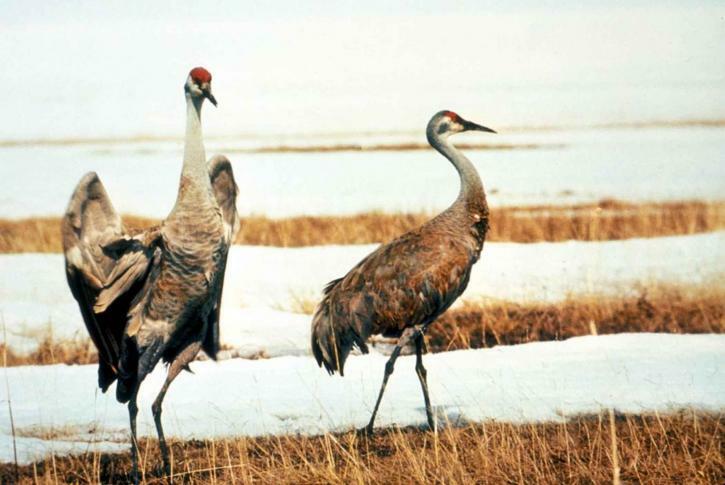 What do beavers, eagles and sand hill cranes have in common? Besides being found in southern Maine, these are all species that choose their mate for life. In nature, there are many types of mating systems in which mate selection is a key element. Often, the female of a species will choose a mate based on a variety of reasons including better offspring survivorship, parenting skills and sometimes even dancing displays. Some species, more commonly birds, do choose a mate for life. A pair of male and female beavers will build a lodge and live together for many years, if not for life. Each year, the female beaver will have a litter of 4-6 offspring depending on the resource availability that year. A family of beavers, or colony, can be anywhere from 2-12 individuals with younger beavers, or kits, remaining in the parents’ colony until 2-3 years of age. The United States national emblem, bald eagles, are also believed to mate for life. Building large nests, the male and female eagles will tend to a pair of eggs each year. Though most abundant in Alaska and Canada, bald eagles can be found across the entire continental US thanks to major species protection efforts and the restriction on the use of DDT in 1972. Sandhill cranes, a visiting feathered friend in southern Maine for breeding season are true mates for life. Through a dancing display of wings, pumping head motions, bowing and leaping, a partner is chosen. Females may begin laying two eggs per season anytime between 2 and 7 years of age. Mated pairs and their offspring stay together through winter but in spring, the 10-month old juveniles separate from their parents. See if you can spot one of nature’s pairs for life on your next walk in Cape Elizabeth!